Originally published in 1898, Elizabeth and her German Garden is the first book by Marie Annette Beauchamp--known all her life as "Elizabeth". The book, anonymously published, was an incredible success, going through printing after printing by several publishers over the next few years. Elizabeth was a cousin of the better-known writer Katherine Mansfield (whose real name was Kathleen Mansfield Beauchamp). Born in Australia, Elizabeth was educated in England. She was reputed to be a fine organist and musician. At a young age, she captured the heart of a German Count, was persuaded to marry him, and went to live in Germany. Over the next years she bore five daughters. After her husband's death and the decline of the estate, she returned to England. 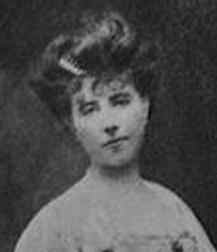 She was a friend to many of high social standing, including people such as H. G. Wells (who considered her one of the finest wits of the day). Some time later she married the brother of Bertrand Russell; which marriage was a failure and ended in divorce. Eventually Elizabeth fled to America at the outbreak of the Second World War, and there died in 1941. Elizabeth is best known to modern readers by the name "Elizabeth von Arnim", author of The Enchanted April which was recently made into a successful film by the same title. Another of her books, Mr. Skeffington was also once made into a film starring Bette Davis, circa 1940. Some of Elizabeth's work is published in modern editions by Virago and other publishers. Among these are: Love, The Enchanted April, Caravaners, Christopher and Columbus, The Pastor's Wife, Mr. Skeffington, The Solitary Summer, and Elizabeth's Adventures in Rugen. Also published by Virago is her non-autobiography All the Dogs of My Life - as the title suggests, it is the story not of her life, but of the lives of the many dogs she owned; though of course it does touch upon her own experiences. A book about the pleasures and wonder that can be found in the garden.